So it's Thanksgiving here in the US, but I wanted to stick to the gaming theme for the month. Why not combine both of them into a game of turkey bowling then! Now before the animals rights activists and vegetarians crawl out of the woodwork on this one, there's absolutely nothing wrong with using a plastic bird instead. Derrick became a self-appointed commissioner of the "Poultry Bowlers Association" and codified the rules and terminology, such as "the fowl line" (cf. "foul line"), "the gobbler (three strikes in a row; cf. 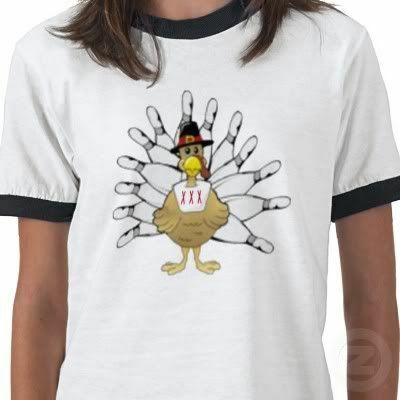 turkey (bowling)), and "the wishbone" (a 7-10 split). What a waste of good food! LOL! !